Recognize mathematical equations, perform operations step by step and give solution onscreen. Capturing all your personal information are easy to gather with this spy calculator camera. It has more options and modes in which consists of the camera and video modes, spy modes, etc., It is easy to use with the help of their mathematical buttons. If you hold down the square root button to enable the spy mode. If you want to take a picture, you would press +/- button, likely, you press -/+ button to start the video. You can take videos up to 120 minutes and also take 300 images. 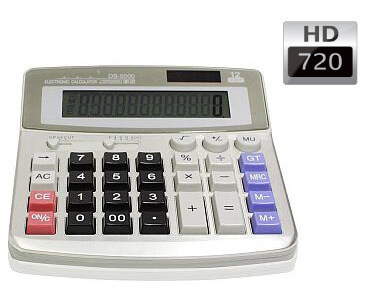 You can also take secret pictures and videos with the help of this calculator camera. Sometimes, you want to see your picture on the computer screen, so you connect with the computer via USB cable and also download and watch later. It has a built-in memory, so you no need to replace any power batteries. You can also charge the calculator through the mini USB charging port. A workplace surveillance camera, which is a calculator hidden camera is one of the perfect spy cameras, they also have a concern to the parents for sending the child to the school. this is a fully functional camera, it will record up o 10 hours to 16 GB of internal memory with the clear 720*480p resolution. It can take pictures at any time with 3 hours of battery life. It looks like a ordinary calculator - 100% undetectable. Start the spy mode by holding down the square root button. Press the +/- button once to take a picture. Hold down the +/- button to start a video. Built-in microphone to record audio. Hidden Camera with motion activationGet the newest and most discreet Spy cam for sale to watch over ..